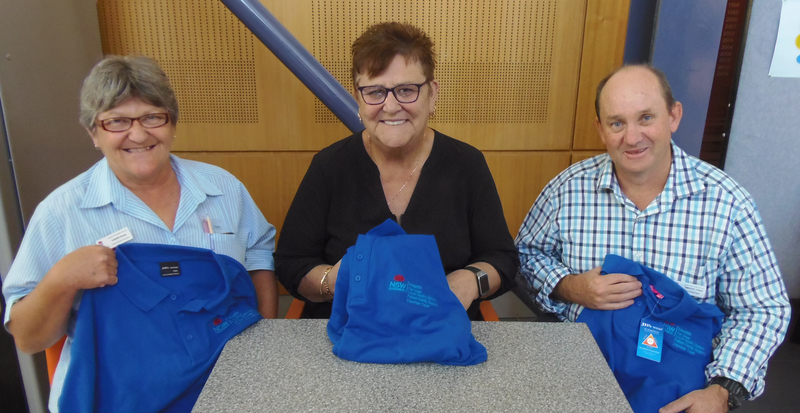 The Far West Local Health District Patient Family Support (PFS) volunteers will be easily recognisable in their role thanks to a generous donation of new shirts. The volunteers were thrilled to receive their new blue polo shirts courtesy of local businesswoman Carrie Oakley. Carrie Oakley (centre) was pleased to present the new shirts to Far West LHD staff members Karen Kemp and Tim O’Neil, who are two of the PFS Team volunteers. The PFS Team will be easily recognised in the Broken Hill Hospital emergency department when they are called out to assist family, carers or loved ones of critically ill patients. Their new blue polos embroidered with their team name will be a welcomed site for staff and families who need their assistance. “After the success and feedback I received after donating the Hot Pink Polos for the Dementia/Delirium and Palliative Care volunteers it was an easy decision to offer to get similar polos for the PFS Team,” said Ms Carrie Oakley. “The volunteers have commented that their new look has raised their profile in the hospital and they feel part of the larger hospital family,” said Mrs Leehane. The Far West LHD and Broken Hill Health Service is very appreciative to Ms Oakley for her generous donation.